Warner Bros. has released a new clip from Aquaman. DC's latest live-action big screen adventure is fast approaching and, for those who aren't already on board (which may be quite a few more casual moviegoers), the studio is doing what they can to try and convince people that this will be worth one's hard-earned time and money. This latest clip gives a good look at Jason Momoa as the titular hero, alongside some of his counterparts, in what paints this as a very fun, very different sort of DC movie. 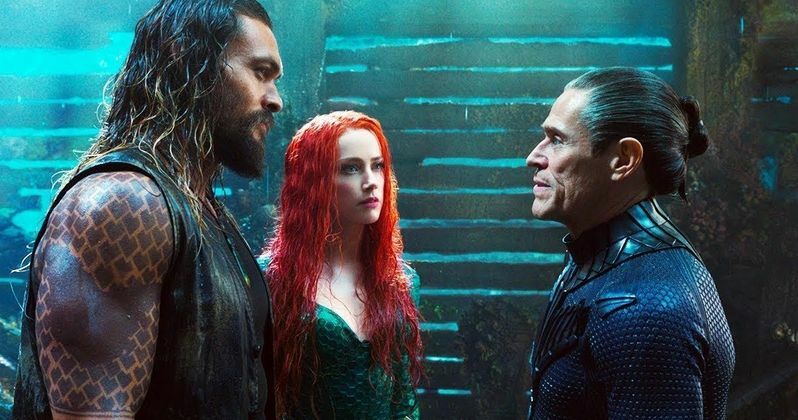 The clip features the man himself, alongside Mera (Amber Heard) and Vulko (Willem Dafoe) discussing the need for Arthur Curry to try and take the throne of Atlantis before his brother Orm (Patrick Wilson) can. Vulko then reveals that Arthur can win over his Atlantean brethren by retrieving the real trident, which isn't quite like the one he already has, the one that fans already saw him wield in Justice League. The clip lays out the plot pretty well and gives a good sense of tone, which is sort of cheesy, humorous and totally works. This is truly the first wave of the future for DC. It's been said plenty of times before but, with Aquaman just around the corner, it bears repeating that Justice League was sort of the last straw for Warner Bros. when it came to Zack Snyder's vision for this universe. The movie wound up being something of a disaster financially and failed to land with the majority of audience members in the way that The Avengers did for Marvel in 2012. That has led to a strong course correction effort behind the scenes and Aquaman is the first movie to hit theaters since. That means it's had to shoulder a lot of responsibility that originally wasn't going to be its burden to take on. That having been said, the early indication is that director James Wan managed to pull it off. While full reviews for the movie haven't arrived online just yet, the initial wave of social media reviews from critics have praised the movie up and down. Specifically, they cite Wan's direction, Jason Momoa's portrayal of Arthur Curry and the fun tone that blends seamlessly with the expansive world created for the DC Comics adaptation. While the DC universe still has a long way to go, it looks like this is going to be a good start to the franchise's future. Next year will see the release of Shazam in April as well as the Joker origin movie in October. Wonder Woman 1984 and Birds of Prey are scheduled for 2020. The cast also includes Nicole Kidman, Dolph Lundgren, Ludi Lin and Yahya Abdul-Mateen II. Amazon Prime members will have the chance to see Aquaman early at special screenings on December 15 before Warner Bros. released the movie nationwide on December 21, where it will go head-to-head with the Transformers spin-off Bumblebee. Be sure to check out the newly released clip below.